This is a set of rules specifically designed to complement the paper models available on the Ships page of this site. They are designed to allow players to refight the naval battles on the Great Lakes during the late 18th and early 19th centuries. The best part is, they're FREE! Download them here. The zipped archive contains the rules, and graphics for all of the necessary markers. Ship Display Sheets for "Away, Boarders!" A selection of ship display sheets from the squadrons that fought on Lake Champlain in 1776 is here. I also have some display sheets for selected ships that fought on Lake Ontario in 1756, during the French and Indian War. 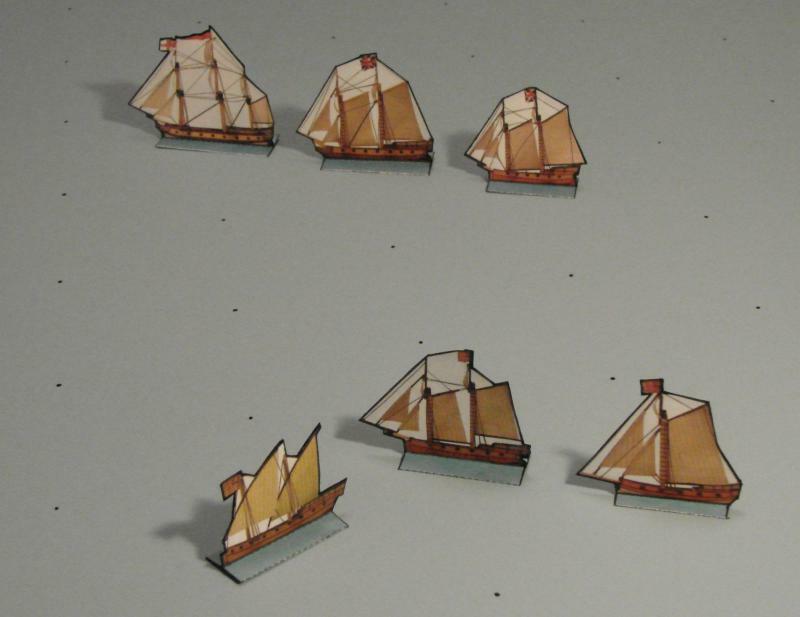 Some of the same models from Lake Champlain can be used to represent these ships on the game table. Get them here. Free Flats and Counters for playing "Away, Boarders!" You can't fight a naval battle without ships . . . if you haven't got any models of Great Lakes gunboats, or haven't built any of mine yet, I have just the solution: a collection of flats and counters you can put together quickly, and get started playing right away! If you're interested in the theory behind this design, you can read my explanation here. The rules and printable components are here. A fully illustrated sample game is here. "Admirals: A Game of Fleet Actions in the Golden Age of Fighting Sail"
A free print-and-play game, primarily for use with miniatures (although flats or counters will work, as well). As the title suggests, the mechanics of this game are simple enough for a single player to command dozens of ships, while exploring the challenges faced by commanders in controlling a fleet of sailing warships in battle. A zip archive with the rules and printable components is here. The page with the game charts was (embarrassingly) left out of the .zip archive! 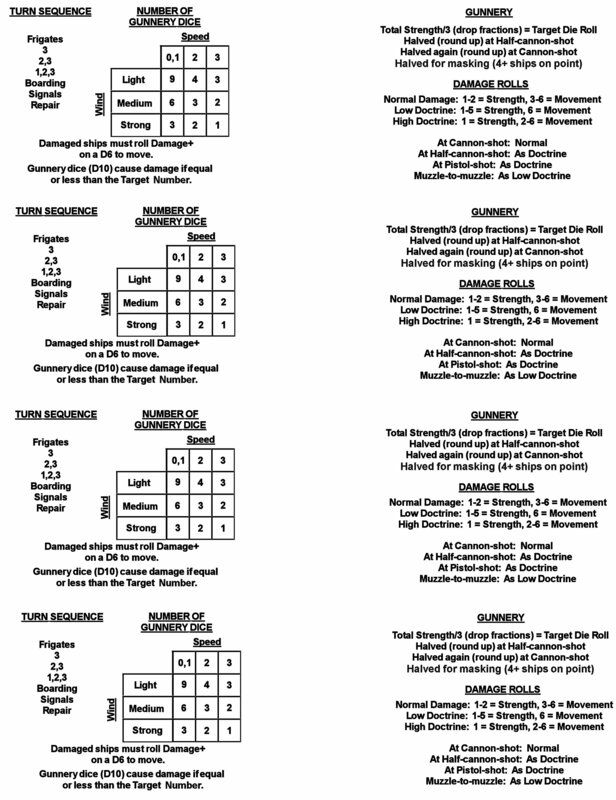 or download this full-page version which, printed and folded in half, will give you four copies of the charts - "Admirals" charts. If you are considering purchasing "NapComII", please Read This First. Check out a Brief Introduction to NapComII here. Just about every wargamer is a rules author too, and I'm no exception. I designed my first wargame back in 1970 . . . a boardgame that bore a remarkable resemblance to what would later be known as Axis and Allies. Since then I've written dozens of them, and even had a few published. Here I offer some of my recent work, for your edification and entertainment.